Almost in my last month! I had a check-up at the gynaecologist's on Thursday but nothing has started happening yet. She did however give us the very first weight estimate we've ever gotten and we were quite shocked. 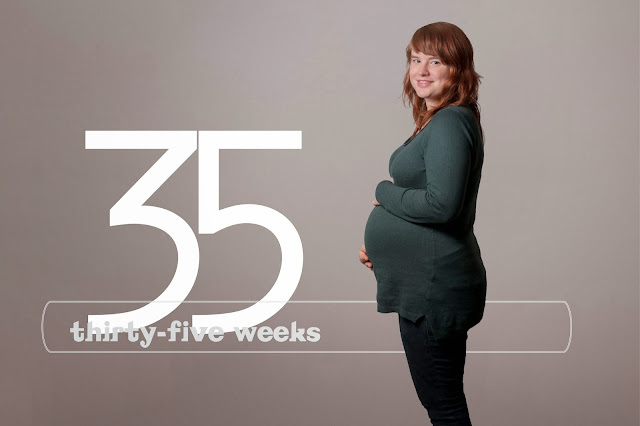 At just 34 weeks and 4 days, the baby supposedly weighed 3.350 kg. (I think the average weight of a baby at 34 weeks is somewhere between 2.2 and 2.8 kg.) Anyway, I got kind of nervous and asked her whether that meant I would be having a 4 kg baby and she smiled a bit uncomfortably and said that that was probably about right. She also measured the thigh bone and I found out that you can supposedly calculate the baby's entire length by multiplying the fibular length by 7. So of course I did the math and my calculator came up with a whopping 52 centimeters already! Luckily babies don't grow much anymore in the last few weeks, they just plump up. Anyway, all of this has made me soooo curious as to what the baby will be like and how it will look. We've just finished printing the addresses on our birth announcement envelopes, and it's a relief to know it's done. I had been begging Klaas to take care of this for weeks, but he always "forgot". Men! My mom and I finished the last of the favors on Tuesday. We didn't want to do it too early because we were afraid the sugar beans would otherwise go bad. Zooo voorbereid dat gij zijt. Respect!